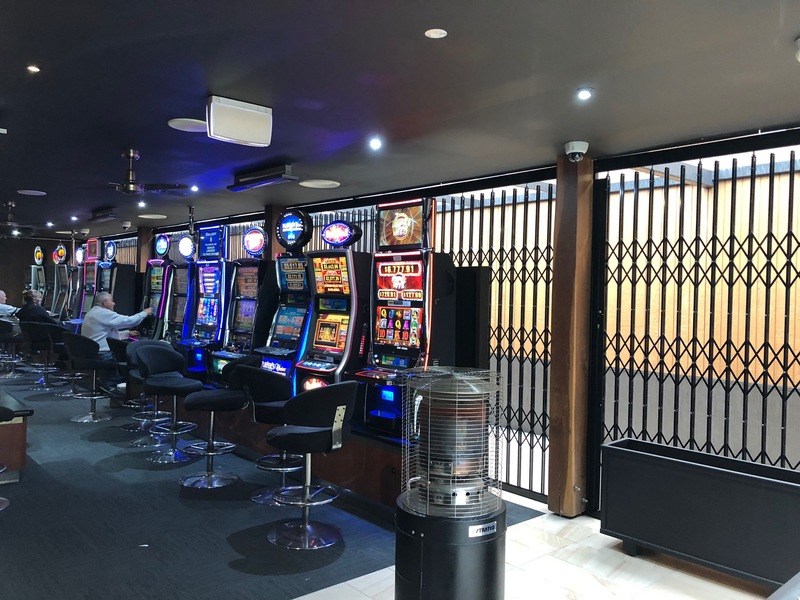 The Australian Trellis Door Company (ATDC) has recently installed its expandable security shutters at Kurri Kurri Bowling Club to protect their poker machines in their gaming rooms. Kurri Kurri is near Cessnock in the Hunter Valley. The shutters installed at the club are precision engineered and custom made to suit each of the apertures.They are top hung from structural support RHS steel members all designed , supplied and installed by ATDC and are powdercoated black satin to blend in with the club’s surrounding décor. The shutters offer full ventilation being an open grille type door with a mesh infill.They expand and fold out of the way when not in use occupying a mere 15% of their expanded width.They are fully framed,lockable and secure.